President Bush’s motorcade will speed through European capitals, but for many, the Bush presidency is already in their rear view mirrors. YOU ARE SITTING in a European sidewalk café. You overhear the word, Bush. What’s next? Furrowed brows and incredulous questions? Whether or not you think our president deserves this disrespect, you’ve likely encountered it. Between now and the election, fellow European travelers, we can cram hope in our suitcases right next to optimism. Before reflecting on my own experience and what Europeans have to say about the tour, I think back to the highlights of yesteryear. Bordeaux, 2007: I could see the taxi driver’s face in the rearview mirror. The radio announcer was interviewing French people about Le Président Des Etats-Unis, and guerre (war). The driver’s eyes scanned mine for comprehension; I gazed out at the vineyards and chateaux. Belly laughs boomed from the front seat. I leaned forward and asked the man in French if he liked the US President. He gave a horrified start and nearly wept with embarrassment, exuding sympathy for me. Slovenia’s news source Delo says: “After eight years of George W. Bush, who embodied all the negative stereotypes and prejudices regarding the US, everyone wants a new American president.” The Slovene word for goodbye is Nasvidenje. 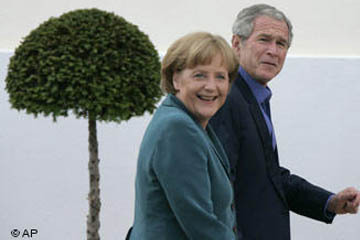 In Germany, our commander-in-chief threw his arm around the shoulder of Chancellor Angela Merkel, causing Europeans to recall July 18, 2006. Bush told Germans, “I could have used better rhetoric.” Will Germans ever again pine for war rhetoric? Nein. “The attention is now on Obama and McCain,” says Antonio Missiroli, research director of the European Policy Centre in Brussels. Which candidate will have a longer shelf-life in Europe? I searched both John McCain and Barack Obama‘s websites under Issues for their positions on foreign policy, looking for specific references to diplomacy. I urge you to do the same. This summer, I’ll travel to England after the Brits cry, Cheerio. We’ll have tea and chat about hope. Then it’s off to Ireland, who wished the Bush SlÃ¡n leat. I’ll lift a Guinness with the Irish and toast to diplomacy. What do you think of Europe’s reaction to Bush’s farewell? Share your thoughts in the comments!